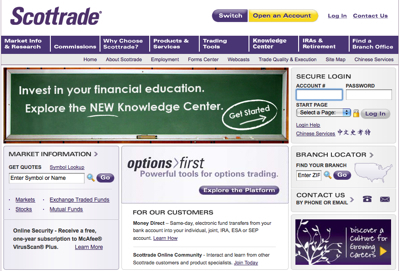 Why I Use Scottrade For My Brokerage Account. 1. I no longer buy and sell individual stocks, and they don’t charge any inactivity or maintenance fees. 2. I trust them with my money. 3. If I ever did trade stocks again, I refuse to pay more than $7 a trade. I have never had a single incident with them screwing something up (unlike with ETrade, which happened all the time), and someone always answers the phone when I call up a local branch. For anyone who actively trades stocks, finding an online brokerage that is both cheap AND trustworthy can be hard to do. With stock trades at just $7 each, Scottrade is one of the least expensive ones around. And because the minimum to open a trading account is only $500 (most require at least a $1,000 minimum), most people can open a brokerage account with them pretty easily compared to some of the bigger, better-known brands. Their user interface is easy enough for my mom to understand, so if she can do it, anyone can. (No offense mom – you just aren’t that computer-literate.) While some of my friends brag about how they are with this or that “big-name” brokerage houses, they pay a lot more for trades and/or inactivity & maintenance fees. I will stick with my Scottrade, thanks. Time To Buy Stock In Gambling, Alcohol & Tobacco Companies. Socially Responsible Investing: Can You Make Money? Solid Mutual Funds With High Minimums. How To Employ A Balanced Investment Approach.